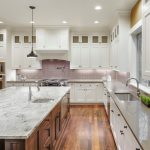 If you’re thinking about adding high-end granite countertops to your Columbus home, we are your go-to company for this request. If you’re thinking about adding high-end granite countertops to your Columbus, Ohio home, we can help. At The Granite Guy, we carry plenty of options, so you’re not limited to choosing from a handful of slabs. Additionally, our showroom has more than 80 large granite slabs available to view. You can take a closer look at the options and make an informed decision. Something that sets us apart is our attention to detail. When you work with our experienced and knowledgeable team members, you’ll see why we have high reviews and plenty of repeat customers. Contact us at The Granite Guy today to get a free estimate for high-end granite countertops at your Columbus home.